Does your job require you to stay perched for eight hours a day, or more? Does your day involve too much sitting, while you're studying? Did you know that sitting too much can be worse than smoking? Probably, yes, otherwise you wouldn't be looking for a quality office chair with support right now! 1.This High Back Executive Mesh Office Computer Chair with Headrest in Black features a slender design that makes it perfect for an office environment. 2.This executive office chair has a deep backrest and a plush seat for a comfortable seating experience. It even features a well-padded headrest and strong armrests. Ergonomically designed and extremely stylish, this chair is the perfect choice for your home office or study. 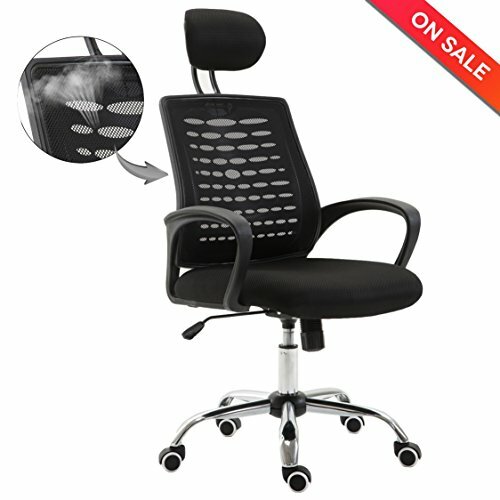 3.This High Back Executive Mesh Office Computer Chair with Headrest in Black is made using premium-quality materials that keep it strong and sturdy. Sporting a metal frame, this office chair is stable and long lasting. The backrest section of the chair is covered in mesh fabric, while the headrest and seat are cushioned and covered in high-quality fabric. 4.Featuring a black color, this executive chair blends seamlessly with any office furniture, irrespective of the color scheme. This High Back Executive Mesh Office Computer Chair with Headrest in Black has a strong metal base that offers maximum support and stability to the structure. The base is completed with caster wheels that ensure ease at mobility. 5.This office chair is easy to clean and maintain. Regularly wipe the chair with a clean, dry cloth and it will look as good as new for years together. Ergonomic Design:Adjustable lumbar support hugs your lower back and enhances the natural curve of your spine. Stable and long lasting:This High Back Executive Mesh Office Computer Chair with Headrest in Black has a strong metal base that offers maximum support and stability to the structure. Apapted also for tall people:The adjustable height and the High-Back supports provide an optimum level of comfort for all type of people with 330 Lbs max weight capacity. Ridiculously Easy Install:The instructions are very easy to follow, you just need to count a few screws and bolts, you can assemble it.Product Dimensions:23.6 x 22.1 x 11.4 inches. If you have any questions about this product by Muzii, contact us by completing and submitting the form below. If you are looking for a specif part number, please include it with your message.